For all kinds of craft projects with beautiful and dramatic effects in minutes. Set out art trays, Colorations® Liquid Watercolor paint, Colorations® No-Drip Foam Paint, cardboard frames, paint scrapers and plastic forks. Cover an art tray with an inch of white Colorations Foam Paint. Drizzle 3-5 colors of Colorations® Liquid Watercolor directly onto the foam. Take a fork or pick and drag it gently through the top layer of foam and paint, creating a “marbled” color pattern. Lay a cardboard frame on the foam paint mix. Lift off and use BioColor® Scraper to scrape off the excess. Frames make wonderful keepsakes and gifts for loved ones. Try using white paint to add contrast to marbled designs. 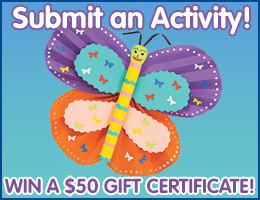 This entry was posted in 15 Minutes, Age Level, Gifts, Preschool (3-5), Time and tagged arts & crafts, color blending, colorations, creativity, foam paint, gifts, kids' activity, kids' craft, liquid watercolor, marbleizing, paint scraper, picture frames, shaving cream on April 25, 2011 by dssactivities4kidz. This is a good activity to do in the grass, or you can just spread a lot of newspapers in an open area. Adults put Liquid Watercolor™ into spray bottles. Use watercolor paper for the most substantial and best blended results, but also try it with Liquid Watercolor™ Texas Snowflake coffee filters or tissue paper. (Note: these will fall apart if too soaked). Use a theme, such as nature (leaves, flowers, etc.) and have the children cut out their own shapes. Have children spray the paper to see what effects can be created. This is an excellent introduction to how primary colors can be blended together to create secondary colors. White Sulphite Paper – 9″ x 12″, 50 lb. This entry was posted in 15 Minutes, Age Level, Arts & Crafts, Creative Arts, Curriculum, Preschool (3-5), Time and tagged arts & crafts, color blending, creative arts, creativity, curriculum, kids' activity, kids' craft, liquid watercolor, spray art, spray bottle, spray paint on March 14, 2011 by dssactivities4kidz. These are sure to liven up any room, but are not intended for use with light bulbs or candles. Gather materials needed for the activity: Liquid Watercolor™ Lanterns, Liquid Watercolor™ paint, spray bottles, glitter glue, sequins, rhinestones and newspaper to protect work area. Pre-fill spray bottles with paint. Following the instructions included, assemble your Liquid Watercolor Lantern. Using a brush or spray bottle, paint the lantern with a colorful variety of Colorations® Liquid Watercolor. Allow to dry. Accent with glitter glue, sequins and rhinestones as desired and hang. Lanterns can make a great addition to parties and celebrations. This is a wonderful activity for small groups. This entry was posted in 15 Minutes, Age Level, Arts & Crafts, Gifts, Preschool (3-5), Time and tagged arts & crafts, color blending, colors, curriculum, decorations, gifts, glitter glue, kids' activity, kids' craft, lantern, lanterns, liquid watercolor, spray bottle on February 14, 2011 by dssactivities4kidz. Watch as the various colors “bleed” in, out and around the see-through gelatin! Gather materials: plain unflavored gelatin, plastic droppers, Liquid Watercolor™ paints, tall containers or mixing bowls and an art tray. Dissolve plain gelatin according to directions on package. When gelatin is ready, pour into tall containers or mixing bowls that have been lightly greased and refrigerate overnight. When set, release the gelatin upside down onto an art tray. Set out paint cups filled with various Colorations® Liquid Watercolors. Using extra long droppers, allow the children to dip ‘n’ poke into the wobbly gelatin. Watch the colors move around inside the gelatin! Cut the gelatin into “worms” or other fun shapes, and let children explore with their hands. Gelatin makes a wonderful tactile activity. This entry was posted in 15 Minutes, Age Level, Arts & Crafts, Creative Arts, Curriculum, Preschool (3-5), Sensory, Time and tagged arts & crafts, color blending, colors, creative arts, creativity, curriculum, food, liquid watercolor, sensory on October 25, 2010 by dssactivities4kidz.